Get the skills to build engaging, interactive user experiences on the web as a front-end web developer. Learn everything you need to design and develop user-facing code, and discover how to bring concepts to life on the browser canvas by combining essential graphic design and coding principles. Use APIs to fetch data for your applications. Begin building with Front End frameworks and build offline capable websites. Leverage the power of the React UI library. Convert an existing application to use React and build your own single page React app that uses the Google Maps API. Work with both back-end and front-end technologies as a full-stack developer. You'll develop a solid foundation for working with servers and host configurations, performing database integrations, and troubleshooting front-end development issues. This course helps developers learn to use PHP to build interconnected webpages with dynamic content which can pass data between pages. This course covers the basics you need to know to build elegant applications of any scale with Laravel. The instructor goes over some of the basic pieces of the framework, and then covers how to build a browse, read, edit, add, and delete (BREAD) API in Laravel. This program provides many of the common data analysis tools used to gather, analyze and adapt your data to feed business decisions. Introduction to fundamental programming concepts such as variables, loops and functions. Step by Step explanations, visual Examples, practical Assignments. This course will guide you through an array of topics concerning why the command line is a necessary tool for Data Scientists. This course will teach you how to use SQL to manage data that is held in relational databases. We will also cover working with REST APIs. Visualizing data, including bar graphs, pie charts, Venn diagrams, histograms, and dot plots. Analyzing data, including mean, median, and mode, plus range and IQR and box-and-whisker plots. This program includes concepts from statistics, computer science, and software engineering. We learn the necessary skills to manage and analyze data. You will develop new skills and improve your understanding of this challenging yet lucrative sub-field of Data Science. You will also learn how to create custom Functions and how to deal with advance concepts in Python. Learn about Kaggle, model selection and tuning, Natural Language Processing, Tokenizing the Headlines, and much more. Hadoop training with MapReduce, HDFS, Spark, Flink, Hive, HBase, MongoDB, Cassandra, Kafka and more. 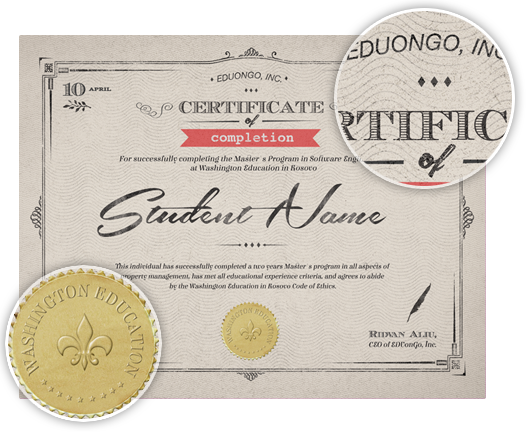 All graduates receive an official certificate signed by BIEG and EDUonGo, Inc.
EDUonGo partners with over 1000 institutions across 109 countries. They provide quality education to the world by enabling subject-matter experts and institutions to use the best state of the art technology on the market. EDUonGo’s certified engineers work for fortune 500 companies where they produce world-class projects. Will BIEG ever offer degree programs? Never say never! However, BIEG currently only trains new students and graduates from other schools in order to help launch them into their dream careers.